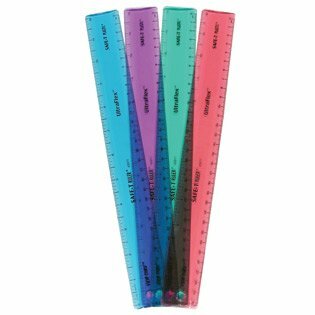 Twist and roll this UltraFlex™ 12″ / 30 cm ruler to measure curved and angular surfaces accurately. SAFE-T® Plastic will not break or shatter under normal classroom conditions. Features both U.S. customary and metric scales. Transparency lets students see what they’re measuring. Ruler regains its flat shape when not in use. Colors vary.